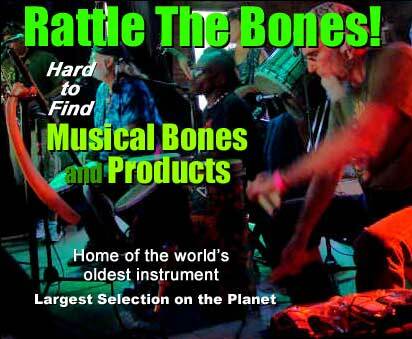 What the heck are rhythm bones? FREE U.S. SHIPPING...on orders with qualifying items totaling $99 or more! Look for this logo to get free shipping on selected items throughout the store. If all items in your order qualify for free shipping and total $99 or more, then your order ships FREE! To get Bonus Discount prices you must login before adding items to shopping cart. Largest selection of Shooting Star and Whamdiddle bones in the universe. Browse our excellent variety of Shooting Star and Whamdiddle bones. If you can't find them here, then you won't find them anywhere. Matched pairs...matched sets too! Play along with the graceful style of Richard "Mr. Bones" Thomas. Called "kuai ban" in Mandarin which literally means "fast clacker." Traditional minstrel design, exotic wood...plain price. Featherweight Bottle Cap washboard gloves deliver dampened moderate tone & they're gentle on your washboard rub surface. Airmesh keeps hands cool. Shooting Star Ziricote Bones, Wide (32mm): 1-1/4"
Shooting Star Vermillion Bones, Wide (29mm): 1-1/8"